Where did the people of Kolomoki go? later this house-type appeared at the very important archaeological site known as Cahokia near modern-day St. Louis, Missouri. Did the elite families of Kolomoki migrate into Arkansas and Missouri after they left southwest Georgia? Sometime around A.D. 675 the volcano Popocatepetl in central Mexico had one of its largest eruptions ever. 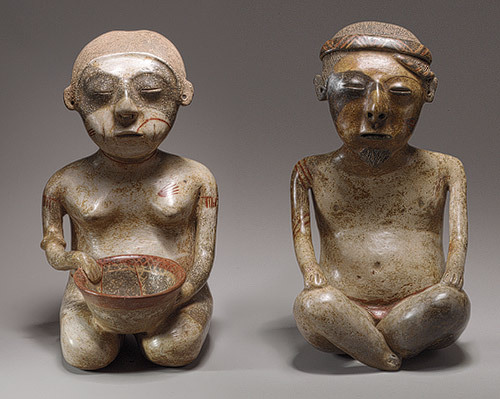 The great Mexican city of Teotihuacan also went into decline around the same time. Teotihuacan was the most populous city in the New World and the sixth most populous in the entire world but by A.D. 750 both Teotihuacan and Kolomoki would be abandoned and their inhabitants would migrate to other areas. The great Teotihuacan would be burned by its own rioting inhabitants. They would also smash statues of their rain god perhaps for failing to deliver the much needed rain. Around the world a similar pattern occurred: established empires crumbled and new powers emerged. 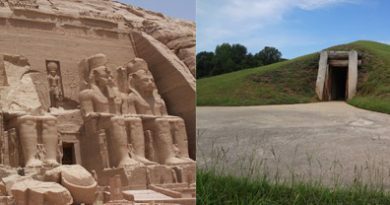 It is also interesting to note that the large mound at Kolomoki, Mound A, was at one point covered in white clay and then eventually capped with a final red clay layer. Had Kolomoki changed from a “white” peace town into a “red” war town before its decline? The stage was now set for the arrival of a new people in Georgia who came from the west and brought with them new ideas. 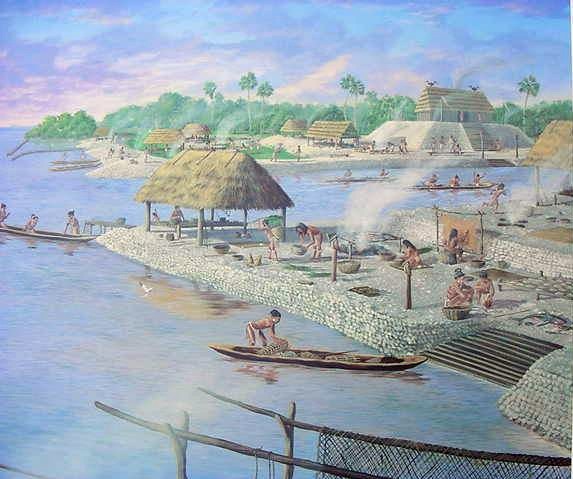 These people were the Mississippians and they constructed the next great site in our story: Ocmulgee Mounds. Pluckhahn, Thomas J. Kolomoki: Settlement, Ceremony, and Status in the Deep South, A.D. 350 to 750. Tuscaloosa, AL: University of Alabama Press, 2003. Pluckhahn, Thomas. 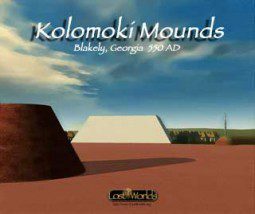 “Kolomoki Mounds.” New Georgia Encyclopedia. 2002. Morgan, William N. Pre-Columbian Architecture in Eastern North America. Gainesville, FL: University of Florida Press, 1999. Milner, Richard Sanders. 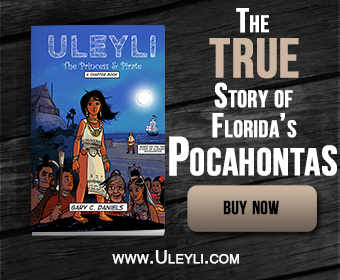 “Apalachicola.” Northwest Florida Place Names of Indian Origin. 1998. Williams, Mark. Hitchiti- An Early Georgia Language. LAMAR Institute Publication 21, 1992..
Smith, David. 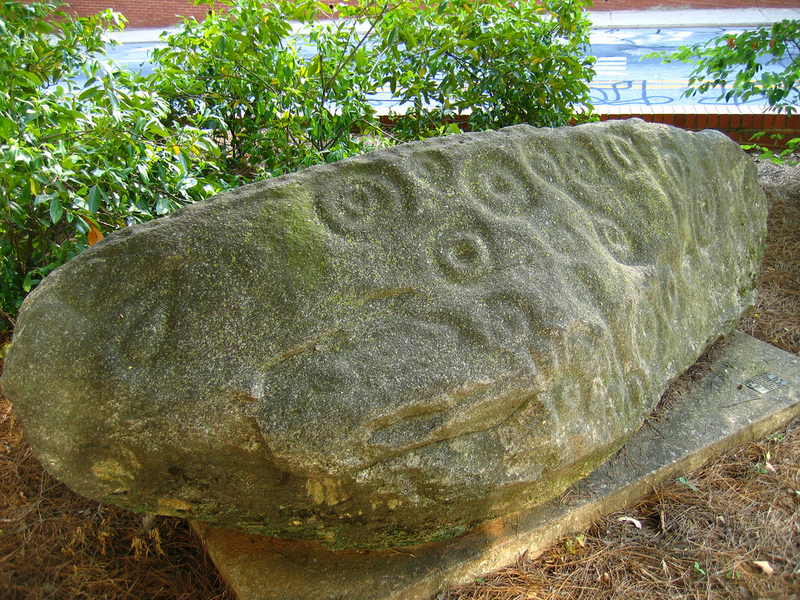 “Quetzalcoatl- The Plumed Serpent.” Atlanta Antiquity. 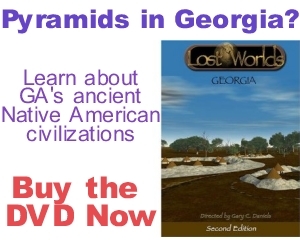 Greater Atlanta Archaeological Society, September 2009. Smith, David. “Three Designs that Represent the Year ‘2 Cane. '” Atlanta Antiquity. Greater Atlanta Archaeological Society, July 2009. Morelli, Keith. “45-Foot Ancient Canoe Stuck in the Muck of Weedon Island.” The Tampa Tribune, 5 May 2008. “Extreme weather events of 535-536.” Wikipedia.org. Keys, David. Catastrophe: A Quest for the Origins of the Modern World. New York: Ballantine Books, 1999. Than, Ker. “Comet smashes triggered ancient famine.” New Scientist, 07 January 2009. Abbott, Dallas H. “Mega Tsunami of the World Oceans: Chevron Dune Formation, Micro-Ejecta, and Rapid Climate Change as the evidence of Recent Oceanic Bolide Impacts.” Geophysical Hazards. International Year of Planet Earth, 2010, Part 5, 197-227. Palfrey, Dale Hoyt. 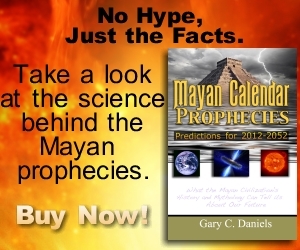 “Mysteries of the Fifth Sun: the Aztec Calendar.” Mexconnect.com. Whipple, Fred L. “Photographic meteor studies. III. The Taurid shower.” Proceedings of the American Philosophical Society, 83, 711-745, 1940. Thorton, Richard. “America’s architectural heritage: Kolomoki, the town in the middle of nowhere.” Examiner.com, 18 March 2010.